The Turks had ruled Palestine as part of the Ottoman Empire's Syrian province since conquering the entire Middle East in the early 16th century. During all these years a Jewish presence had continued to exist in the area, mainly in the four holy cities of Safed, Tiberias, Hebron and Jerusalem. The size of the Jewish community had varied, in 1880 numbering around 25.000, comprising about 1/10 of the total population. Oppression and persecution in 1880's Europe lead many Jews to emigrate, especially from the Russian controlled Eastern European provinces. One of the targets was Palestine. In the first major wave of immigration an estimated 25.000 Jews arrived. Thus, at the turn of the century there were about 50.000 Jews in Palestine, of a total population of 350.000. In respons to European anti-Semitism the Austrian-Jewish journalist and writer Theodor Herzl in 1896 published the book "Der Judenstaat" (The Jewish State). He described a modern social-democratic soceity, in which Jews would be able to live in peace and self-determination. One year later at the first Zionist Congress (Zion is another word for Israel) a world-wide organization was founded with the explicit aim of "establishing a home for the Jewish people in Palestine, guaranteed under international law." Herzl and the other Zionist leaders sought backing for the project with the leadears of the major powers - the Ottoman Empire, Germany and England. Only the latter showed any interest in the idea. Renewed Russian pogroms at the start of the century spurred another wave of immigration to Palestine. Jewish organisations collected funds all over the world and purchased land, on which the newly arrived Jews established farms and towns. In 1909 the first kibbutz (socialist agricultural community) was established, and the same year the city of Tel Aviv was founded close to the Arab port of Jaffa. Many Arabs also found their way to Palestine during this time. 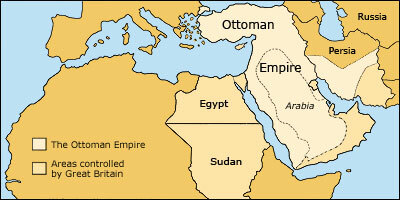 In 1914 the Jewish popolation had grown to 85.000, the Arab to 500.000. As Britain planned its invasion of the Ottoman Empire, of which Palestine was a part, it tried to build alliances in several directions. In 1915, in a secret correspondance with the Emir of Mecca, Britain promised support for Arab independence in the Middle East. In 1916 a secret deal to divide the spoils of war was struck with France, and in 1917 the British government issued the "Balfour Declaration" promising the Zionist Organization support for the establishment of "a national home for the Jewish people" in Palestine. 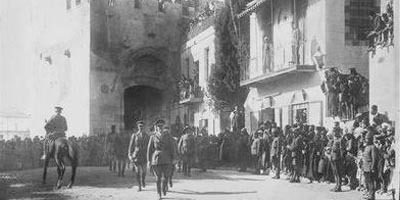 The British General Allenby enters Jerusalem, December 1917. As the Ottoman Empire entered World War I on the side of the Central Powers it was now at war with England, and soon after British troops invaded all of the Ottoman Middle East. In 1917 General Allenby conquered Jerusalem, and one year after Damascus. 1920 - The Establishment of "Mandates"
After the war the victors divided the Middle East into a number of "mandate" areas, under French and British administration. Syria (today Syria and Lebanon) was awarded to France, while Palestine (today's Jordan and Israel including Gaza and the West Bank) and Mesopotamia (Iraq) came under British control. The promise of the establishment of a national home for the Jews in Palestine was integrated into the mandate agreement. 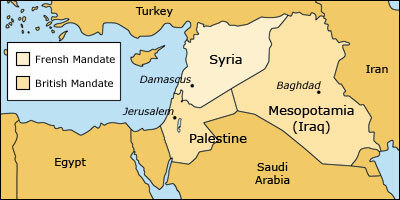 The mandates for Syria, Palestine and Mesopotamia. classroom use if supplied with a clear copyright notice. The material may not be published in any form without written permission.